In a small bowl, warm the milk to about 100 degrees. Add the yeast and the 1/2 tsp. sugar – whisk or stir; set aside for 10 minutes – the yeast gets foamy during this time. Meanwhile, in a large bowl, place the flour, brown sugar, all the spices, and stir. Add yeast mixture and beat together. One at a time at the eggs beating well after you add each. Gradually add the butter and mix it very well – until the dough comes together. Don’t get discouraged at this point, sometimes it looks like a sticky blob, but then you dump it out onto a a well-floured counter top and knead it for about 5 minutes. It comes together very nicely. Knead it into a ball. Lightly grease a large bowl, place the dough ball in, and turnover to make sure both side are greased. Cover the bowl with plastic wrap and put it in a warm spot until it’s doubled its size – this takes about 90 minutes. When dough is ready, take it out of the bowl onto a very lightly floured surface and punch it down. Roll it out into a long log-type shape and divide it into about 12 pieces. (You can pinch off 12 pieces from the dough ball if you want to. I use the log method because it works best for me for measuring purposes). Form each of the balls into a nice smooth ball and place on a baking sheet that you have lined with parchment paper or a very lightly greased sheet pan (parchment paper is a very good investment). Cover this with plastic wrap that you’ve lightly sprayed with cooking spray – to avoid sticking – and place in a warm spot for 30 minutes. Your best bet is to preheat your oven now to 400 degrees then place the tray on top of that for 30 minutes. 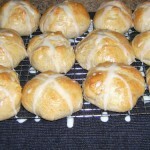 With a small, sharp knife, make an “X” into the top of each bun. Place baking sheet in oven and bake for about 20 minutes – they will be nicely browned. Place on a rack to cool. Make the glaze by whisking/mixing both the sugar and milk together in a medium bowl. 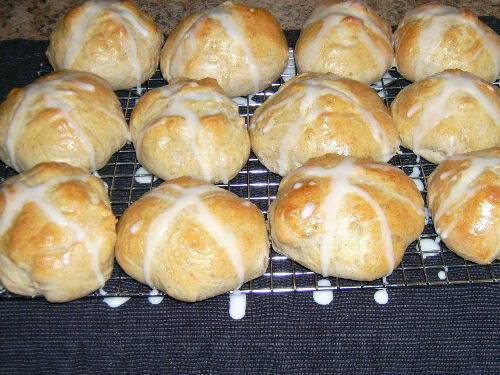 Pipe the “X” onto each bun or you can ice as you wish.